Twenty One Pilots confound genre lines so exuberantly that even Wikipedia has no idea what to make of them. 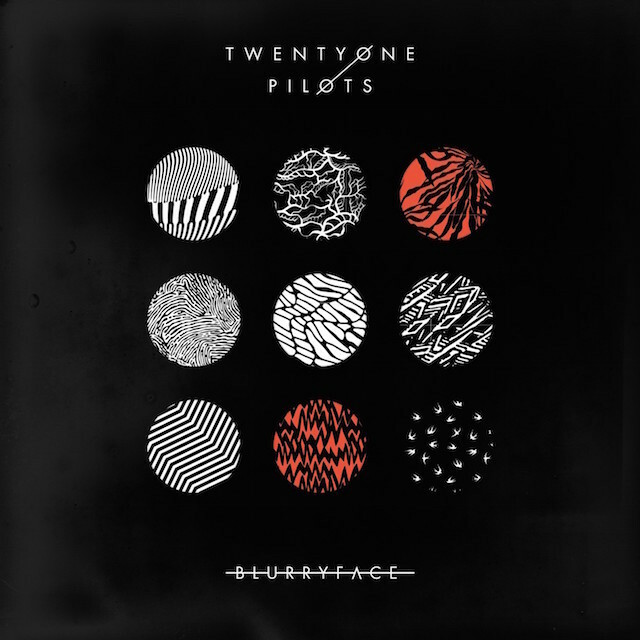 The Wikipedia article on their new album, Blurryface, out since May, classifies them as “alternative hip hop,” “electropop,” “indie pop,” “reggae,” “rock” (among other things); the album plays like an encyclopedia of every single trend, no matter how fleeting or silly, that has graced the pop charts in the last five years. Sudden breakdowns and a cappella interludes, dopey chants and falsetto jumps and the occasional rap with ukulele strumming and synthesizer confetti all over the place paradoxically meld into a single cohesive style that, against all your skeptical, tentative reservations, somehow gets stuck in your head for days, weeks, obstinately refusing to leave. That’s not how genre works! That’s not allowed! Well, as it happens that’s not exactly how Blurryface works either. Hitherto a disconnected experimental band averaging ten different veer-worthy directions per minute, the Ohio duo, since signing with eminent pseudopunk label Fueled By Ramen, has evolved into a tight, melodic emo/electropop outfit, crafting short, punchy slabs of glistening electronic verse-chorus-verse, one after another after another, gleefully accelerating without ever quite losing control. Like Fall Out Boy or fellow labelmates Panic! at the Disco, both former guitarslingers turned electropop hustlers, drummer Josh Dun and singer/polyinstrumentalist Tyler Joseph reach out with feeling so strong it’s shocking and irresistible at once — emotional urgency so outrageous that the band runs away with your pleasure receptors even as the rational side of your brain demands to know what the hell is going on. Their single cohesive style, while constantly getting tweaked and inverted, still dominates, but unlike the aforementioned acts — the former currently topping the charts with the most voracious style of arena-kitsch known to the American public, the latter getting slicker and more androgynous by the minute — Twenty One Pilots’s electropop lacks melodrama. They’re goofy, cheerful, mild, approachable, chatty; they sing with a smile. 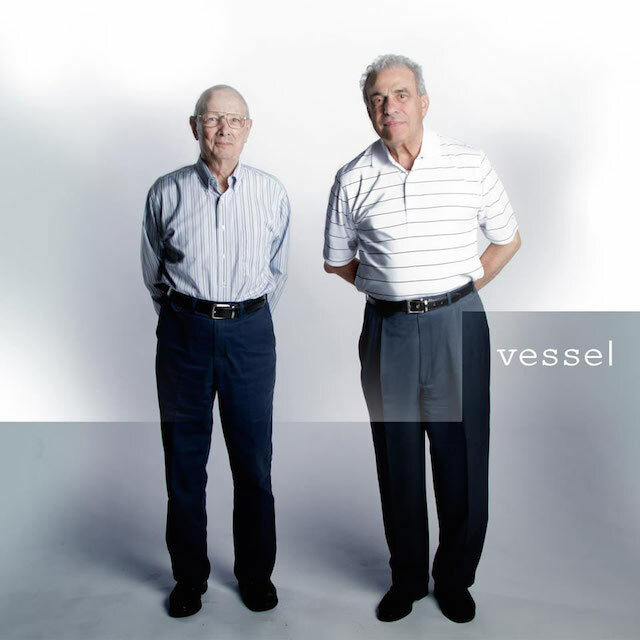 Their major-label debut, 2013’s Vessel, didn’t quite cohere; they rapped too much (or so that method of verbal delivery is called); the music shifted gears too haphazardly. On Blurryface, by contrast, the rapping is kept to a minimum (most of the time they’re just speak-singing), and the songs fit together. Although the album integrates any number of weird sounds and exotic instruments, these are mere parts in a glorious pop whole. It’s not a seamless pop whole, or an impeccable one — but it’s an intricate one. Like most emo-pop, this is Male Angst Music, and it fills the appropriate quotas of fragility, bluster, tenderness, edge. While the music maintains an electronic smoothness whose polished surface provides the album’s sonic constant, lead singer Joseph unpredictably slides between a clean shout and a dry, tangy, vulnerable, utterly arresting drawlsqueakcroak that keeps cracking and malfunctioning and breaking down (did he just clear his throat? did he just slip into patois? not really, but it’s definitely not the typical emo whine) while venting lyrics that concern existential frustration more than romantic frustration and express more genuine anxiety than any singer working today, you pick the genre. He worries about ethics; he worries about being a good brother and a good son; he worries about what other people think; he worries about his debt; he worries about having to make money; he worries about not liking his own music; he worries about not understanding his own music; he triumphs over his inner negativity with joy, warmth, positive energy. Persona-wise, he’s another everyman outsider obsessing over his feelings, one of those famed sadboys whose pouts can cut through steel and whose tears can water a broken heart back to life. But where so many such sadboys put on expressionistic shows of agony, cloud their mood swings in moony metaphor, and (most commonly, and hatefully) use their anxiety to rationalize their misogyny, Joseph comes across like a decent human being, and while his lyrics have a certain elegance to them, they’re also quite straightforward, written in plain English for anybody to understand. (Sample: “We don’t believe what’s on TV/because it’s what we want to see/and what we want we know we can’t believe/we have all learned to kill our dreams.”) Thus does he voice his anxiety in a sweet, empathetic way that tugs on the heartstrings kindly, eagerly, without being manipulative — all while the music’s shameless, flamboyant pop hookery tugs devilishly and hyperactively on the hedonism nerve. Keen on a special style of upbeat melody that starts simple and then, marveling at its own dancerlike agility, suddenly twists out of reach, Blurryface glides by on a tense, elastic, sticky, juicy synthesizer groove. It varies from song to song (“Fairly Local” jitters and skates over sneaky rhythm keyboards and drum machines, on “Hometown” the keyboards reach massive proportions, on “Ride” what sounds like an organ pokes its nose in, and “Lane Boy” features altogether bleepier textures), but always those same spritzy, fizzly, whirring electroblades keep the beat going. The resulting music sharpens Joseph’s songwriting, gives it some bite, some glam, some glitz, a sense of play. Only then — because pure pop slickness bores them, because they’re perpetually neurotic overachievers, because they have an ear for how to mess up a song and make you love it anyway — the band keeps interrupting the groove, slicing it in half, stopping it right when you were getting into it and making you readjust. Sometimes they’ll change tempo, sometimes they’ll switch over to what sounds like a totally different song; sometimes they’ll just throw in a short, cartoonish bridge/interlude. “Not Today” splits one of its choruses in half with a random exclamation by Joseph (“Don’t you test me though! Just because I play the piano!”), backed with rapid drumslam. “We Don’t Believe What’s On TV” charges forward ferociously except on the chorus, during which the drums stop and dinky, intricate horns take over. “Lane Boy” stops in the middle for an explosive, spiraling dubstep breakdown. “The Judge” features a bridge that comes as an interruption and a continuation simultaneously, doubling the ukulele strum and changing the melody in a way that feels totally natural; indeed, it caps the song’s anthemic drive quite thrillingly. Always they return to the original groove — they only want to jab holes in it, not blow it up completely — always the songs click perfectly into place, always the beat goes on. But those interruptions, messing with your expectations, keeping you on edge, are what make the beat so sublime and so meaningful. The interruptions lend the music a jittery, nervous quality that complements Joseph’s anxiety exactly. The beat itself overwhelms that anxiety with radiant, excited energy. The two in tandem make for a pop thrill that’s seriously weird, a glossy record staggering through its moves, a disjointed record smoother than butter. One more thing. As Jessica Hopper eloquently points out in The First Collection of Criticism by a Living Female Rock Critic (2015), most emo sadboys objectify women even more than rappers do. The genre treats women as items to be won, targets of rage and anguish, idealized, identity-free catalysts for the singer’s broken heart and ensuing flood of feelings, ultimately boiling down to empty units of symbolic capital. Joseph, by contrast, indulges in none of this. His songs treat women as people, and people worth celebrating. Try “We Don’t Believe What’s On TV,” and especially “Tear in My Heart,” the finest happy love song I’ve heard all year, whose fabulous chorus bears repeating: “She’s the tear in my heart/I’m alive/she’s the tear in my heart/I’m on fire/she’s the tear in my heart/take me higher than I’ve ever been.” The song rockets to life with a simple, blocky keyboard hook, Joseph sings a short verse, and then the chorus explodes. He sings another verse, the keyboard remaining constant, and then the keyboard explodes again, this time driving even higher. The beat suddenly stops and Joseph delivers a spoken-word interlude during which she falls asleep in his car and he drives around the potholes in the road so she can sleep undisturbed. Then the song starts up again. The final chorus shoots up into the air, sparks flying, embers popping, synthesizers sizzling, spiraling around and around, taking him higher than he’s ever been. Blurryface (2015) and Vessel (2013) are available from Amazon and other online retailers.